Unlike New York's Central Park or San Francisco's Golden Gate Park, which are huge rectangles in the middle of the urban landscape, Griffith Park, the crown jewel of the LA Parks Department, is over 4200 acres at the east end of the Santa Monica Mountain Range. Some of the park is landscaped recreation area, but most of it is chaparral-covered mountain wilderness and steep wooded canyons. Griffith Park is home to a number of popular museums and attractions, in addition to abundant opportunities to explore the natural environment. 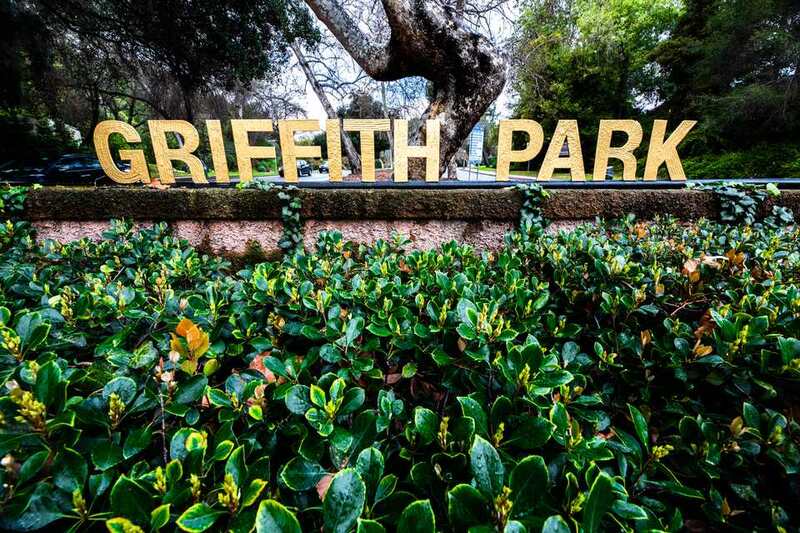 The park was named for industrialist Griffith J. Griffith, who acquired this section of what was once the Rancho Los Feliz Spanish land grant and bequeathed 3015 acres to the City of Los Angeles to be used as parkland. The park has expanded numerous times over the years, most recently with the additions of Mt. Lee, home of the Hollywood Sign, and the Cahuenga Peak behind it. Griffith's dreams for the park, for which he left a substantial trust fund, included the construction of the Greek Theatre and Griffith Observatory, both completed after his death. In addition to those attractions, Griffith Park is home to the Los Angeles Zoo, the Autry National Center, the Travel Town train museum, and the Los Angeles Equestrian Center as well as numerous smaller diversions like the carousel, pony rides and train rides. The park also has a full complement of golf courses, tennis courts, soccer fields and a pool. However, the many miles of hiking trails are one of the park's primary draws. The park is roughly bordered by Los Feliz Blvd in the south and Route 134 (the Ventura Freeway) and the LA River in the north, Interstate 5 freeway to the east. The western boundary is a wiggly line through the Hollywood Hills. There are a few pieces that cross over those borders, like the LA Equestrian Center north of the Ventura Freeway and the Los Feliz Golf Course east of the 5 Freeway. The main access to the park from I-5 is from the freeway. From SR 134 eastbound, take either the Forest Lawn Drive or Victory Boulevard off-ramps. From SR 134 westbound, take Zoo Drive or Forest Lawn Drive. After leaving freeways, follow the signs into the park. See each of the attraction descriptions that follow for the best entrance to that destination. Griffith Observatory is one of LA's top landmarks, both for its views of Downtown LA and the Hollywood Sign, as well as for its other functions as a space observatory, planetarium and astronomy museum. It is one of the top free things to do in Los Angeles. The Observatory is accessible on the south side of the park from Los Feliz Blvd via Fern Dell if you're coming from Hollywood or from the Western Avenue exit on the 101 Freeway or via Hillhurst Avenue if you're coming from the Los Feliz exit on the 5 Freeway. There are signs to the observatory from both streets. The Los Angeles Zoo and Botanical Garden is on the East side of Griffith Park. It is not as well known as its southern neighbor, the San Diego Zoo, but it provides an opportunity for locals and visitors to observe living examples of animals from around the world as well as some local wildlife. The Zoo is accessible from Zoo Drive off the 5 Freeway (Golden State Freeway) or the Riverside Drive exit from SR 134 (Ventura Freeway). The Autry in Griffith Park is part of the Autry National Center. It is a museum devoted to telling the stories of the American West - the real American West and the TV and movie version. They have an extensive collection of Native American artifacts and accouterments of Old West life as well as costumes and props from Hollywood's most famous cowboys. Mount Lee, where the ​Hollywood Sign is located, and Cahuenga Peak behind it, were added to Griffith Park in 2010, after a successful "Save Our Peak" campaign to raise funds to purchase the land and save it from private development. The Greek Theatre was part of Griffith J. Griffith's original vision for the Griffith Park. It was completed in 1930. The 5700-seat outdoor theater is one of LA's top entertainment venues. While the Hollywood Bowl reigns for summer classical music, the Greek hosts primarily top pop artists. The Greek Theatre can be reached from the Los Feliz exit off the I5 Freeway, heading west, then following the signs to turn right on Hillhurst and right on Vermont. From the 10 Freeway, take the Vermont exit north into the park to the theater. From the 101 Hollywood Freeway south, take the Vine Street exit, which dumps you off on Franklin Avenue heading east. Turn left at Western, which curves into Los Feliz, then turn left again on Vermont. Travel Town is a train museum on the northwest corner of Griffith Park. There are a variety of train engines, cabooses and passenger and freight cars from different eras displayed on tracks, as well as other railroad and other transportation artifacts inside an exhibit barn. There is a miniature train that you can ride around Travel Town for a small fee. The museum itself is free, but gladly accepts donations. Griffith Park has three different train rides! Two are miniature trains that you ride in. One of those is the Travel Town Railroad. The other is the Griffith Park and Southern Railroad, located at the southeast corner of the park near Los Feliz Blvd and Riverside Drive. A train has operated at that spot since the 1940s. It makes a mile loop past the pony rides, crossing a meadow, chugging through an old Western town, and traversing a Native American village. The Griffith Park and Southern Railroad shares parking with the Pony Rides. The third option for train rides is Los Angeles Live Steamers at Griffith Park, a non-profit museum run by a local train club that operates their own scale model 7 1/2 gage ride upon steam trains on a track adjacent to Travel Town. In addition to the train rides, there are exhibits including a Stationary Steam Plant and a number of retired train cars. Except for the Sunday before Memorial Day and the 1st Sunday in October. The Griffith Park Merry-Go-Round is located in Park Center between the Los Angeles Zoo and the Los Feliz park entrance. The classic carousel was built in 1926 by the Spillman Engineering Company and brought to Griffith Park in 1937. The Merry-Go-Round has 68 hand-carved jumping horses with jewel-encrusted bridles. The Stinson 165 Military Band Organ plays over 1500 selections of marches and waltz music. The Merry-Go-Round is open 11 am to 5 pm weekends all year and weekdays during summer, and Easter and Christmas school vacations. The Merry-Go-Round is on the east side of Griffith Park off Crystal Springs Road, south of the Zoo and Wilson and Harding golf courses at Park Center and shares parking with tennis courts and a playground. It is accessible from the south off of Los Feliz (coming off the 5 Freeway or from Hollywood), or via Zoo Drive from the north. Their Phone number is (323) 665-3051. There is also a modern Merry-Go-Round with a whole menagerie of animals to ride inside the LA Zoo. There are several ways to ride horses and ponies at Griffith Park. A guided horseback ride to the Hollywood Sign is one of the most romantic things to do in LA. If you're just visiting and would like through take a trail ride through Griffith Park, there are three private stables that offer trail rides in Griffith Park. Each stable has slightly different offerings, but they all offer on-demand guided trail rides for varying lengths of time, as well as scheduled group rides, including Hollywood Sign rides, dinner rides and twilight rides. Griffith Park Horse Rental is located at the LA Equestrian Center on the North side of the park. They offer walk-in trail rides leaving up to four times per hour with a 1-hour minimum. Children 6 and older can participate. They also offer 20-minute kiddie rides for kids under 6 or under 4-feet tall. After hours rides can be arranged for double the daytime rates. They also offer a Sunset Ride to a Mexican Restaurant (food and drinks not included). This stable charges a weight surcharge for riders over 200 lbs. Rocken P Outfitters at Diamond Bar Stables (1850 Riverside Drive, Glendale, CA 91201) is located just next to the Glendale/Burbank border, where Riverside Drive becomes West Riverside Drive, so the street numbers are confusing.) Trail rides are offered from 30 minutes and up, ages 7 and up, maximum weight 250 lbs. Trail rides are first come, first served. Three-hour Hollywood Sign Rides and Dinner Rides and Night Rides require reservations. Sunset Ranch Hollywood (3400 North Beachwood Drive, Los Angeles, CA 90068, (323) 469-5450) is at the north end of Beachwood Drive on the West side of Griffith Park that offers a variety of trail rides including one and two-hour casual trail rides, evening group rides, BBQ rides and dinner rides. Sunset Ranch gets the most attention from tourists, due to its easy access from Hollywood and location just below the Hollywood Sign. You can book a Sunset Ranch Trail Ride including transportation from LA or Anaheim hotels from Viator.com. For youngsters, the Griffith Park Pony Rides is a private concession located on Crystal Springs Drive near the Los Feliz entrance. LA Equestrian Center is useful if you have your own horse or are organizing a horse show. Read more about horseback riding and guided trail rides in Los Angeles. Griffith Park is over 4000 acres of mountains and canyons at the east end of the Santa Monica Mountains that separate Hollywood and Echo Park from Burbank and Glendale in the Valley. There are 53 miles of dirt and paved trails, bridle paths and fire roads open to hikers. On those trails you'll find the diversity of Angelenos from trail-running vegans to black-clad Goth teens, from celebrities and corporate executives to inner-city gang bangers, enjoying the natural wonders at our doorstep. It's easy to get turned around out on the trails. There are wilderness areas where you completely lose sight of the city around you, so be sure to follow common sense hiking practices like letting someone know where you are going, having a trail map, and making sure your cell phone is fully charged so you can call for help if you get in trouble (although there are some areas with no cell signal). People have gone missing for days and died after getting lost in Griffith Park. There is no smoking or lighting of fires permitted anywhere in the park, due to high wildfire danger. All trails officially close at dusk, but it's not uncommon for local groups to lead evening hikes in Griffith Park. Maps of trails and current information on trail closures and special restrictions are available at the Ranger Station, 4730 Crystal Springs Drive, Los Angeles, CA 90027, (323) 913-4688. For a popular trail closer to Hollywood, you can hike Runyon Canyon, which is within walking distance of Hollywood Boulevard. Griffith Park has four municipal golf courses. There are two 18 hole courses adjacent to each other just south of the LA Zoo, a 9-hole course off of Vermont and Commonwealth, and a 9-hole course on Los Feliz. To make a reservation to play on city courses either requires a Department of Recreation and Parks Player Card (Golf Card) that can be acquired for an annual fee, or you can make an 8-Day Reservation without a Golf Card. It takes up to two weeks to get a Golf Card, so plan in advance if you want to play at a city course. You don't need to be a Los Angeles resident to get a Golf Card, but city residents and seniors get special green rates. Anyone 13 years old or older can get a Golf Card, but some courses have other age restrictions. Green fees are in addition to the annual or 3-year fee for a Golf Card. Check the LA Parks website for scheduled course maintenance and closings. 18-hole standard course, opened in 1923. Note: Minimum age is 14 except those certified by a City course manager. You can rent bikes to tour Griffith Park's paved roads and trails from Spokes 'N Stuff Bike Rentals next to the Ranger Station. Cash only during weekdays. Check website for additional hours. Spokes 'N Stuff is included in the Go Los Angeles Card discount attraction card.